Want to know how to become a taxi driver in Ireland? Not sure where to start? Not sure if you fulfill all the requirements? Here we explain in plain English the steps you need to take in order to obtain a taxi driver licence also known as SPSV Drivers Licence. Start by completing a SPSV Training Course or by reading the The Official Manual for Operation in the SPSV Industry and studying the local area map. The SPSV Entry Test is designed to verify that you know the SPSV Regulations, you are familiar with good practice in the industry, and that you have a good working knowledge of the county in which you wish to operate. Obtain a PSV 15/18 application form from your local Garda station and submit it to the Garda station/PSV Office nearest to your residence (if you live outside Dublin) or to the Carriage Office (if you live in Dublin), along with the required documentation. What to Study for your SPSV Test? Study the industry regulations and your area. 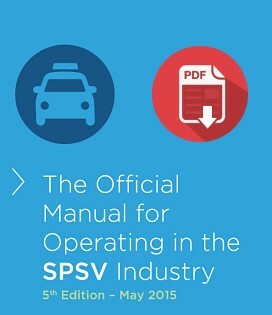 For the industry knowledge test, study The Official Manual for Operation in the SPSV Industry. (download PDF) For the area knowledge test you are advised to examine street and road maps. Don't despair, we can help! Take our SPSV Training Course and greatly increase your chances to pass the SPSV Test. If you have any special requirements, please specify them at the time of booking. There are various options available to assist candidates with special reading needs in taking the test. You can apply to have extra time to take your test or request one-to-one assistance. For further information please call 1890 340 12. When your application has been processed, you will be notified by email or post of the date, time and location of your test, and reminded of the documentation that you must take with you to the test. When you arrive at the test centre, your identification will be checked – bring your current driving licence with you for this purpose. Once your identification and relevant documentation have been validated, you will be taken to a workstation to complete the test. Before the test starts, a short demonstration will show you how to answer the questions, and you can answer some practice questions to get used to the system. You do not need to be able to use a computer to take the test. To take the test, you use a mouse or a touch-screen to answer questions that are presented to you on a computer screen. Each question is presented along with a number of alternative answers. In some cases, only one of the answers presented is correct and you are asked to select the answer you think is correct by clicking on or touching your chosen option. In other cases, you are asked to identify which two of the answers presented are correct by selecting them in the same way. If you make a mistake or change your mind, you can cancel your answer. If you want to skip a question, you can come back and answer it at the end. At the end of each section, you can review your answers and, if you wish, change them. Your test is scored automatically and you get the results immediately. Call the NTA on 0761 064000 and pay over the phone using a credit or debit card. Photograph should be not more than 6 months old. They may be in colour or black and white. The photograph should show a full front view of the subject’s head, as he or she would normally appear. Sunglasses are not acceptable. Tinted glasses may be worn provided they do not obscure the person’s eyes. Photograph should not show military or police uniforms. 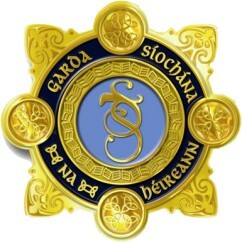 Any additional documents An Garda Síochána may request. After the successful application, you must wait for the An Garda Síochána. to assess you as a suitable person to hold an SPSV driver licence. This assessment can take up to 3 Months and if your application is successful, the Gardaí will issue you with an SPSV driver licence and inform the National Transport Authority. The Authority then sends you the driver identification cards. 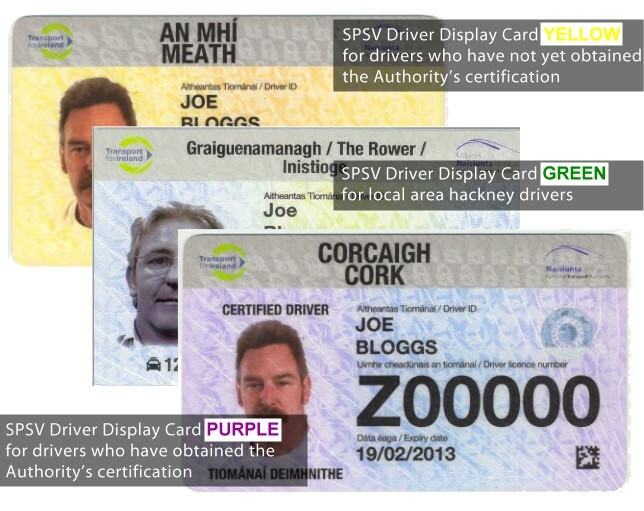 Once you received your SPSV Licence and Smart Card, you can drive a taxi, wheelchair accessible taxi, hackney, wheelchair accessible hackney, local area hackney or a limousine. Note: All queries in relation to your application should be directed to An Garda Síochána. The image below, shows how a SPSV Driver Display Card looks like. This ID should be clearly displayed on the dashboard of the vehicle. 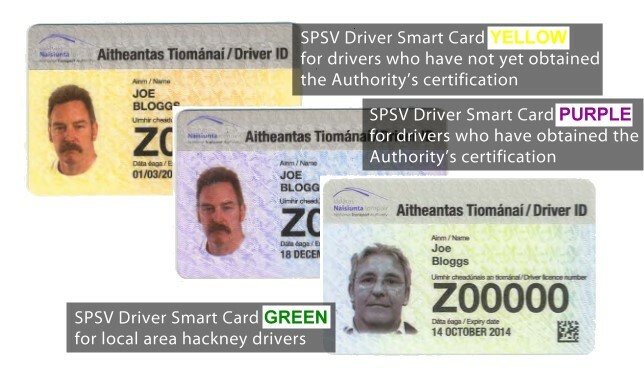 The image below, shows how a SPSV Driver Smart Card looks like. This ID should be on your person when operating a SPSV vehicle. Now that you have all the required paperwork, and you have your own licensed vehicle, you can start working straight away. If you need to rent a taxi read our taxi rental section to find out about your SPSV rental options.